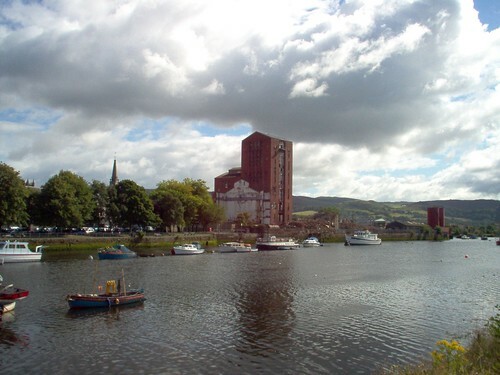 Took a walk through Dumbarton recently and noticed the red brick distillery on the riverside near the castle was missing a few buildings. There's a fair few bites out of the main building as well. Anyone know more? Is any of it being kept, or is it all on the way out? I heard they had to retain the tallest of the buildings to allow the developers to build up to 7 storeys high, if they demolished the whole site they would have been restricted to just 2. That is kind of it Pgcc93 in the sense that if you demolished the tower the local planners don't have the imagination to see beyond National Planning Policy Guidelines which state all non city centre residential development should not exceed 4 storeys. These are just guidelines at the end of the day and on a riverfront site like this you should be doing something special and giving it the importance it needs. Anyway this is not the main reason the tower was retained. The developers wanted to get shot of it. It's an old building at the end of the day and has been pretty much abandoned for a while so it will be expensive to convert into flats. However they were persuaded that it was such a local and regional landmark that it would be worth retaining as its presence would add to the attractiveness of the scheme. Surprisingly, as its pretty much unique in Scotland (its a copy of a Hiram and Walker distillery in Quebec), it hasn't been listed by Historic Scotland so the developers were not obliged to retain it. But ultimately arguments for retention won out, though I gather there has been a bit of local resistance from people who would rather see it come down. Anyway the new scheme is being built around it so that it will front onto a riverside square. Its an attempt to echo the kind of traditional urban structure you get on the west coast of Scotland with churches / civic buildings having squares either built around or in front of them. I think it would be a big loss to Dumbarton if it was removed. A remarkable and pleasing tale, retaining an elderly structure where there is no compulsion. I think I might join the Luddites on the tall buildings in cities though, the 4 storey rule looks quite palatable to me. I'm sure the clever developers will be able to get a few 'specials' through that anyway, so there will be few, which will do nicely. I like a good skyscraper, but not casting my city streets into shadow like in America. Going on the premise that artists impressions always look better than the actual building, it looks like Dumbarton is going to have an absolute eye sore on it's hand. I mean even the picture looks dreadful! If my recollection is correct the majority of it is 4 storeys Apollo. Its only around the square that it steps up to frame the old tower. I'm a canyon man myself. Gives a good big city feel. No city worth its salt should be without one. Don't mind an homogenous 4 storey approach at all but I also like it when the scale changes and soars. You only get that kind of thing in cities and being a total urbanite thats what rocks my boat. You should see parts of Sydney and Melbourne's CBDs were they have had the wisdom to keep the human scale of their victorian buildings but have also been brave enough to insert new high rises. I think the contrast between the two can be fantastic. Well each to his own KonstantinL. I think it shows real promise especially when compared to some of the stuff in Leith or the absolutely dire mock georgian / victorian / noddy townhouse shite that has been put up at Inverkip. And at least the developer listened and didn't just blitz the lot. If the previous plan, by different developers and which had been granted consent by the local planners, had gone ahead there would be nothing left and Dumbarton would have had a nice B&Q shed in a sea of carparking fronting onto the Leven right next to the town centre. Hmmmm very urban! Would that not have made a nice eye sore? I know which one I'd prefer. We're talking about Dumbarton town centre here, not Milngavie. In any case a 13 storey tower isn't a "skyscraper" and it overlooks a public square, not peoples houses. The brewery tower acts as a "marker" for the town centre and injects much needed dynamism to the skyline, thanks to this project it (and the new build tower) will continue to do so. The site demands something of stature and, thankfully, that looks like what's getting delivered. I'm impressed to see something of this quality rise outside Glasgow city centre, its a real coup. I had been resigned to a new Barratt estate. The planning application for the project is still running, which is only to be expected given the size and complexity of the scheme, in parallel with all the other projects currently underway or proposed. Feedback on the project is being sought by Carvill, with a public display next week. My name is Bill Johnston and I work for Carvill (Scotland) Ltd. We are a residential development company and we have recently submitted a planning application to develop the former Allied Distillers Site in Dumbarton. I was very interested to note that a forum was opened on your website within a few days (hours even!!!) of our submission and that it generated quite a bit of interest. Currently, we are involved in some public consultation for this project and I would like to enquire whether you would permit us to use your forums for some additional feedback. The main thrust of the consultation is a public display running on the 4th, 5th & 6th of August where people can come along and see a 3D model of the project together with a computer generated fly through, various plans, etc as well as discuss the proposal with representatives from Carvill and their Design Team. The display is being held at the Riverside Parish Church Hall, Castle Street, Dumbarton. If you think that this would be appropriate I would be delighted if you could post this message up for your users and invite them to comment on the scheme, particularly those who are interested in the regeneration of Dumbarton Town Centre. Excellent! I've magpied the juicy stuff for a summary. The taller tower is a refurb of the existing brick "mill". What materials are the new builds though? Both towers in profile including (for the first time) the new build "lighthouse". The Parish church makes for interesting contrast. A view of site from other side of the Leven.